On Sunday, May 1, 2016, Pastor Joe Troutman preached, “Stones of Remembrance” from Joshua 4:1-10. God will not allow his people to forget his saving act of redemption through the life, death and resurrection of his Son. 1. Twelve Stones—Just as God desired the Israelites never forget the miraculous crossing of the Jordan River into the Promised Land, so he desires for us never to forget the miraculous saving work of his Son on the cross. 2. When Your Children Ask—The bread and wine of the Lord’s Supper, which we hold in our hands, takes us back to the most significant event in history, the death of the Son of God in the place of sinners. We need to be reminded of the good things that God has done for us, and God has instituted that memorials be set up to make us remember, so when our covenant children ask the meaning of the elements, we had best be ready to explain. 3. Obedience to the Lord—God has commanded you to remember what he has done in Christ for sinners, and we ought regularly to remind ourselves, lest we forget. Listen to “Stones of Remembrance” (Joshua 4:1-10) at mcopc.org. At a time in which the very word church sounds a tone of dull irrelevance, the doctrine of the church has suffered the studied neglect of many Christian leaders. The persistent demands to market, manage and grow the church and to meet the felt needs of churched and unchurched all threaten to quench theological reflection on the abiding nature and mission of the church. But few activities bear greater promise as a starting point for renewing and reshaping the Christian church than the work of theology. 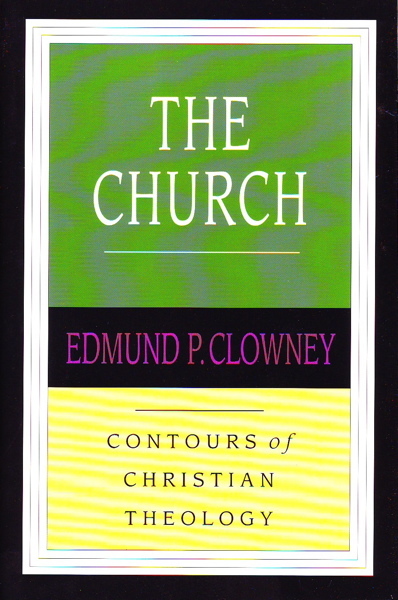 In this book Edmund Clowney takes up that task, addressing along the way a variety of contemporary concerns: worship, mission, church and culture, church and state, church order and discipline, the ministry of women, baptism and the Lord’s Supper, tongues and prophecy, signs and wonders. He draws on decades of thinking and teaching about the church as well as from his committed leadership and ministry within the church. Biblical, historical, systematic and Reformed, The Church is a timely and provocative reflection on the life, order and purpose of the household of God. Edmund P. Clowney (1917-2005) was a professor of practical theology and former president of Westminster Theological Seminary in Philadelphia. He is the author of The Message of 1 Peter in The Bible Speaks today series.